As described in Chapter 5 of the book, Brigadier General Terry and his 931-soldier brigade departed in mid-May 1876 from Fort Lincoln (refer to the map below). Lt. Col. Custer and the 7th Cavalry were attached to this brigade as it headed west to the Yellowstone River to locate the Sioux and Northern Cheyenne. The passage west would be uneventful until it reached Rosebud Creek. At this location, Terry dispatched the 7th Cavalry up Rosebud Creek and the results were disastrous for Custer and several hundred soldiers. Custer committed four blunder that are described in the book and these contributed to this deadly outcome. 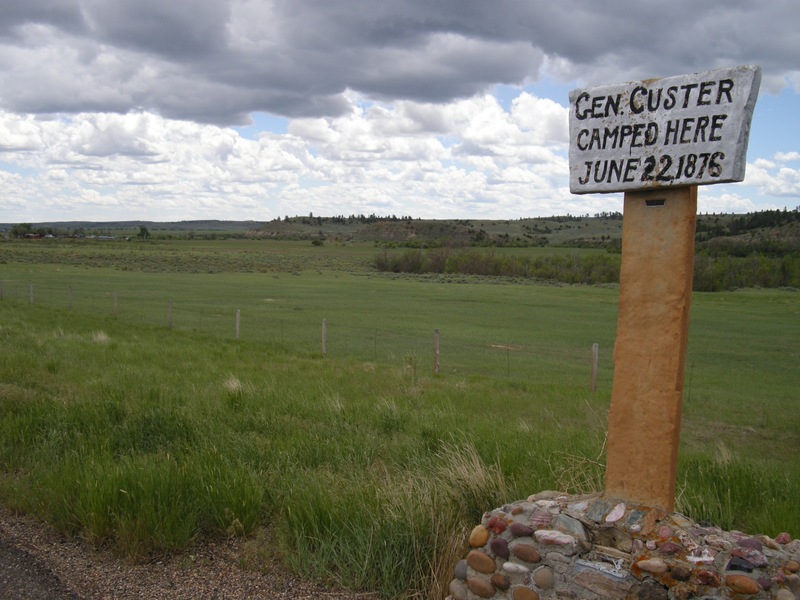 As the sign describes, Custer and his 7th Cavalry camped at this location on their first night. 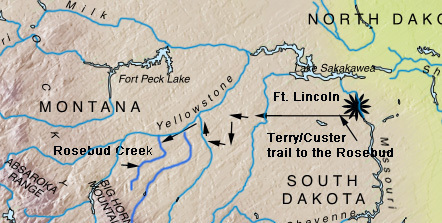 In two days, Custer would deviate from Terry's oreders and head directly to the massive Sioux and Northern Cheyenne village Rosebud Creek flows to the right among the low chapperal in the middle distance below the low bluffs.